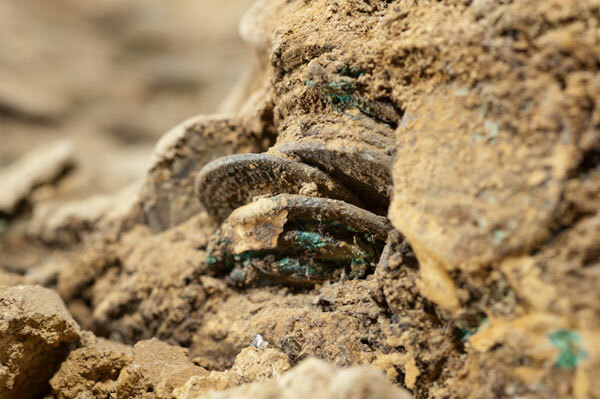 Just a clump of corroded coins – until deciphered using X-ray equipment and the expertise of the BM’s Roger Bland. Of all the wonderful things I’ve seen recently on sites or in museums, from the Silchester olive stone to a stocky little bronze Valkyrie looking up crossly from a clod of frozen Danish mud, to a pretty white goat ambling in sunlight across a fresco still buried in a dark tunnel 50m below the modern town of Herculaneum, nothing startled me more than a shower of scruffy Roman coins, twisting and turning as they fell. Coins are not really my thing. I can get excited about one coin, but walk me round a coin gallery and the shutters of my brain start to creak shut. I couldn’t have told you what these were, other than 10p-sized, corroded silver, and distinctly unappealing – and even I could have guessed Roman because of the slight clue in the battered heads of emperors. Roger Bland from the BritishMuseum, of course, just sat down and listed off the coin types, turning them over and spreading them out to line up the heads of Vespasian and Trajan. The excitement came because at this point nobody had actually physically seen the coins: they were still a clump of corroded metal and mud tightly packed into a coffee-mug-sized pot found by a metal detector in Selby. The coins were falling past me on a computer screen in a back room at Southampton University, while a few feet away a giant X-ray machine inside a locked room, originally built to scan Rolls-Royce turbine blades for invisible flaws, clunked and whirred as it got to grips with an elephant’s skull. The computer boffins then set to work processing the scans, until layers of the images could be peeled away and separated out, so that the Roger Blands of the world could flick through them like somebody reading from a bus timetable. When the coins were later carefully extracted, cleaned, and conserved, the computer and the coin anorak – if Roger will forgive me – were completely vindicated. The technique didn’t work on another hoard because the clump of coins and muck was too thick for the rays to penetrate, but undoubtedly at some point in the future it will. Nothing for me can beat the visceral thrill of the encounter with the real object – but I could see that day in the next ten years when computers will do things for archaeology that I can’t even predict. It will be astonishing.